It is heartening that in the post-apartheid South Africa a growing number of independent-minded black journalists are showing the guts and insight to tackle the state on its numerous failings. Below is an article, scanned in two parts, from the most recent Sunday Times, South Africa's widest-selling weekly newspaper. Subsequent to this appearing the ANC national executive committee, instead of censuring Zuma, said the Nkandla debacle had nothing to do with the ANC itself, and so washed its hands of the whole affair. Whether parliament is able or willing to impeach him is highly doubtful, for reasons made abundantly clear in Mthombothi's article. To read the article, left click on the text and it will come up in a readable format. 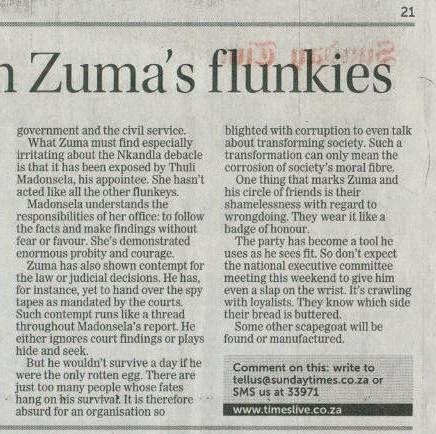 By the way, I have submitted a short letter praising Mthombothi's article for publication in the Times. Let's see if they use it.